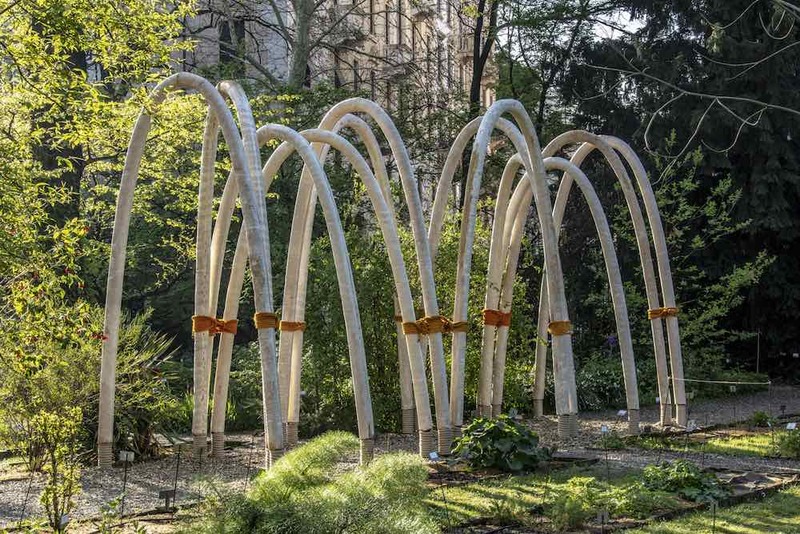 antoni gaudi architecture carlo ratti circular economy fuorisalone Garden interni magazine milan milan 2019 mushroom There Is Not Planet B! 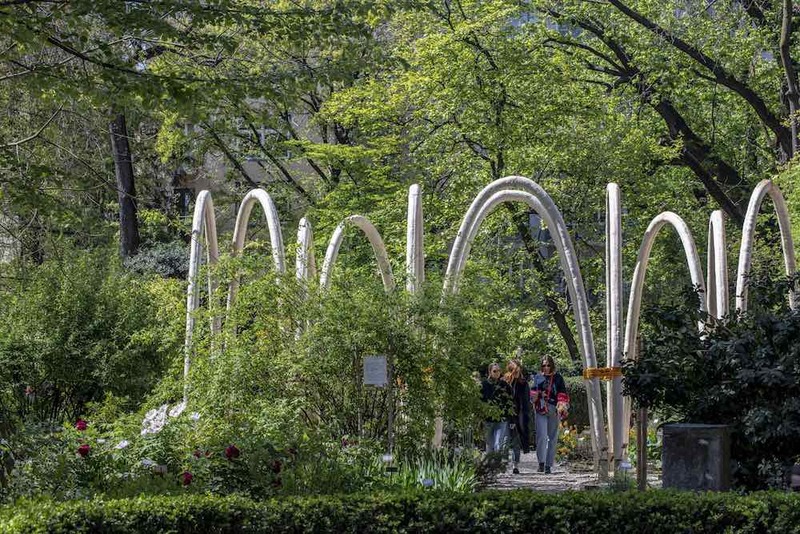 Milan 2019 – Over the past six weeks a 1-km long mycelium – the fibrous root of mushrooms – has been growing within the Brera’s hidden botanic orchard in Milan to create a sustainable organic structure composed by a series of arches. 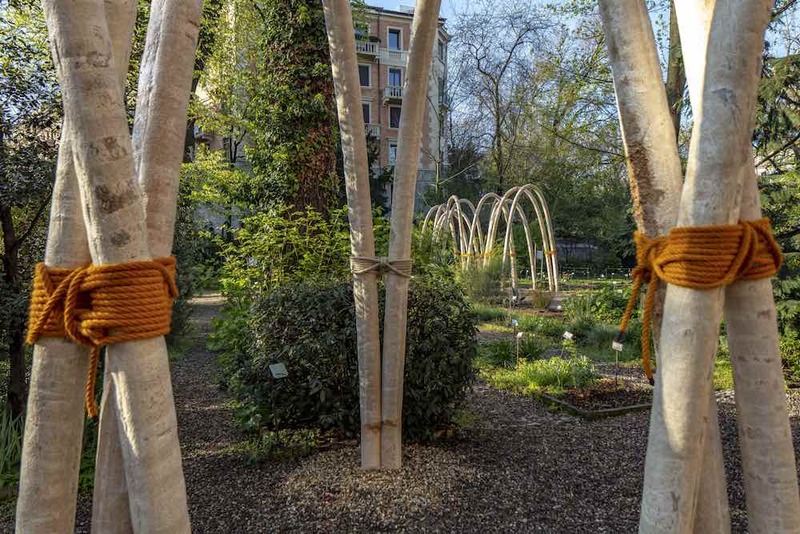 Called THE CIRCULAR GARDEN, the bio-architecture by CRA-Carlo Ratti Associati together with global energy company Eni, was grown organically and will return to nature in a fully circular way. 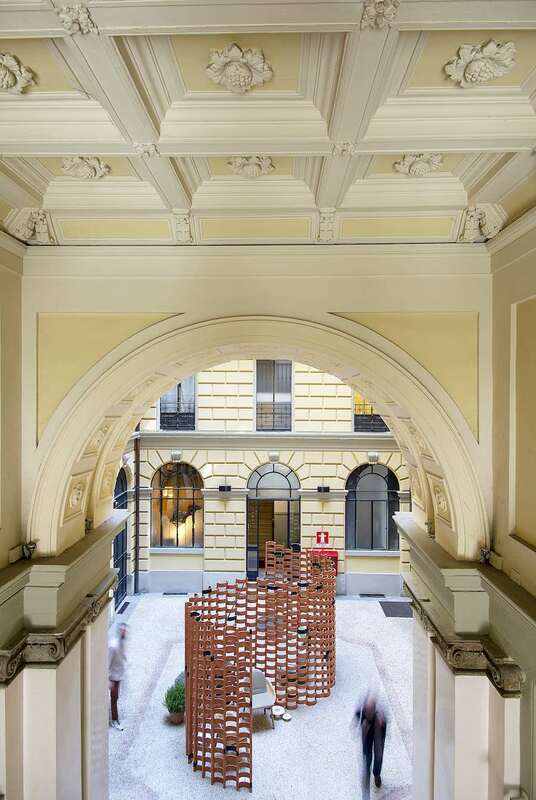 The project is part of the INTERNI Magazine ‘diffused’ HUMAN SCALE programme of installations for Fuorisalone 2019. Many pavilions designed for temporary exhibitions and fairs – such as for Milan Design Week – end up generating large amounts of waste. 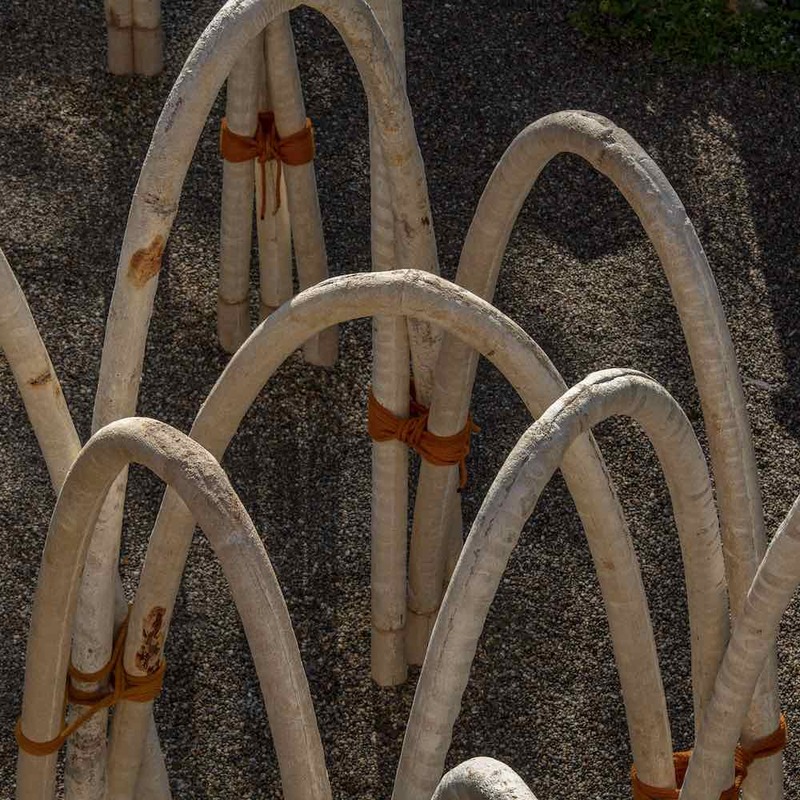 THE CIRCULAR GARDEN project will be reused in a circular fashion – mushrooms, ropes and wood chips will go back to the soil while small metal elements will be recycled. 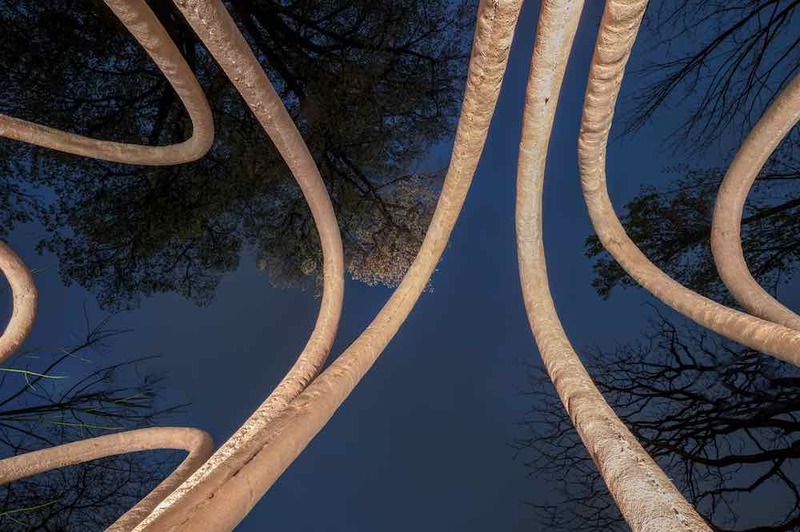 The installation pushes the boundaries of using mushrooms in design. 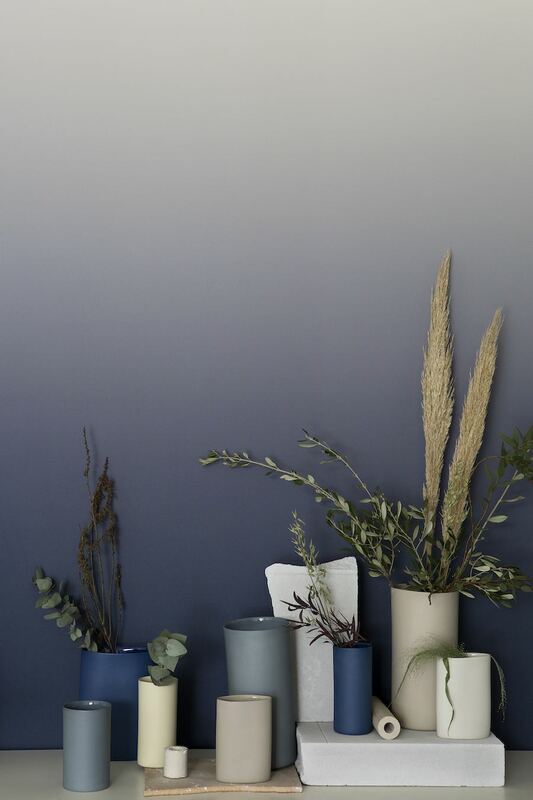 In recent years, mycelium has been employed for sustainable packaging and small brick-like objects. 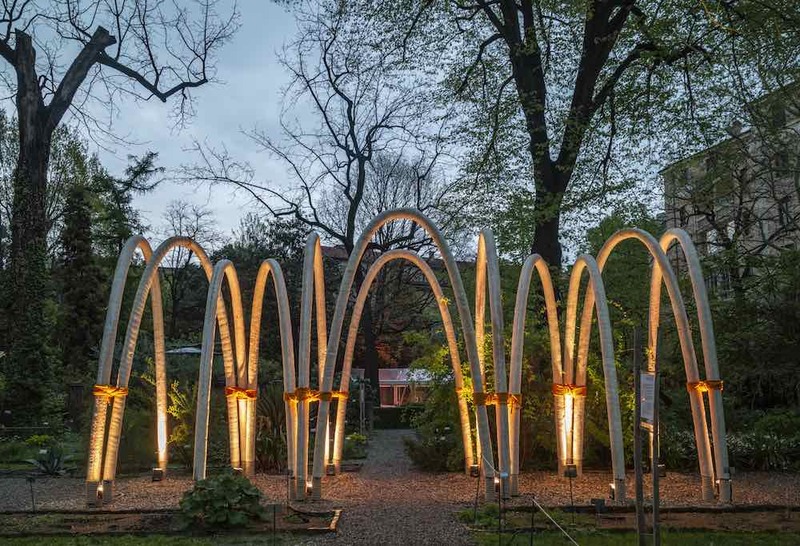 Carlo Ratti’s project engages with mycelium at the architectural scale – with a series of 60 4-meter-high arches. 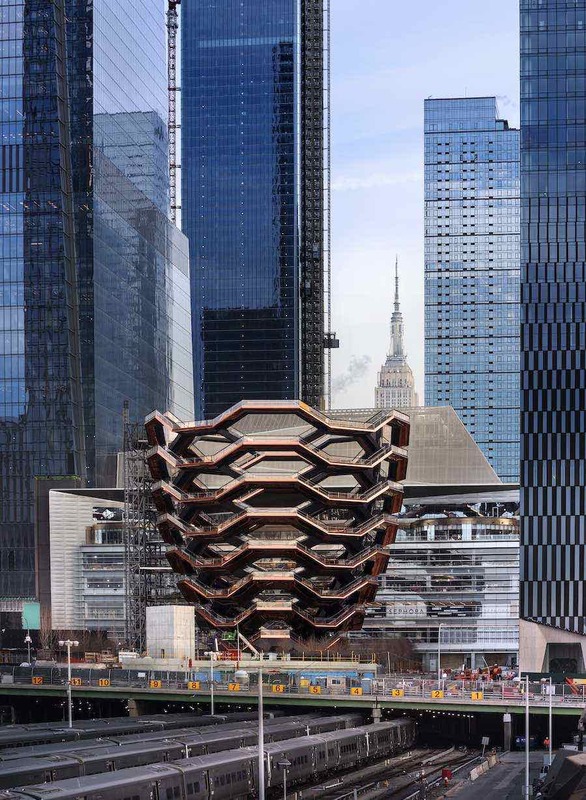 In order to create self-supporting mushroom-made structures on such a scale, the project takes inspiration from the great Catalan architect Antoni Gaudí. 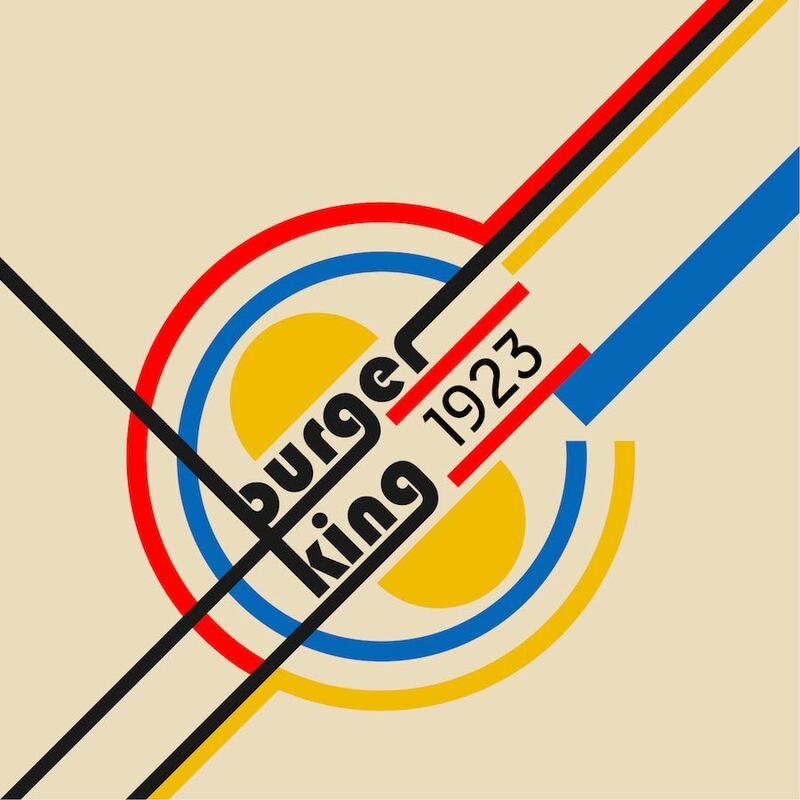 It was he, while designing the Sagrada Familia in Barcelona, who resurrected the a forgotten method to create pure compression structures is to find their form using suspended catenaries. The same applies to the Circular Garden, where the catenaries compose a series of four architectural “open rooms” scattered throughout the garden. 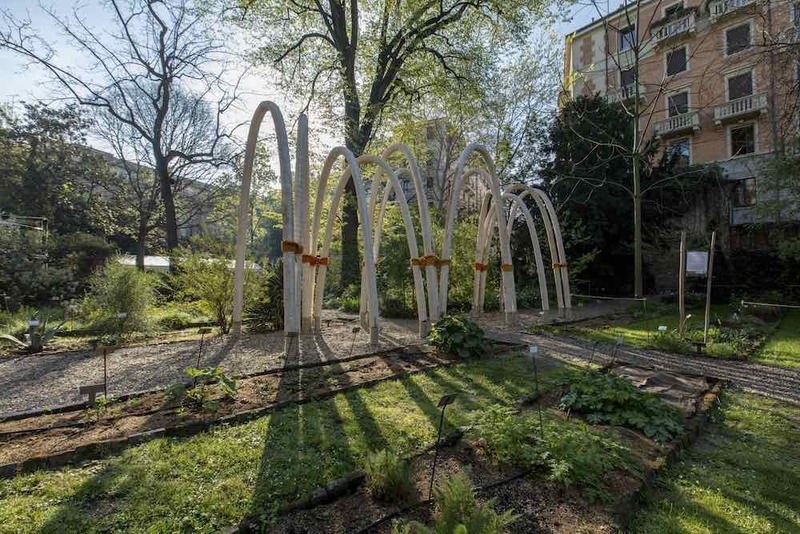 The mycelium was grown in the two months preceding the opening of the Circular Garden with the help of leading experts in the field of mycology. Spores were injected into organic material to start the growth process. 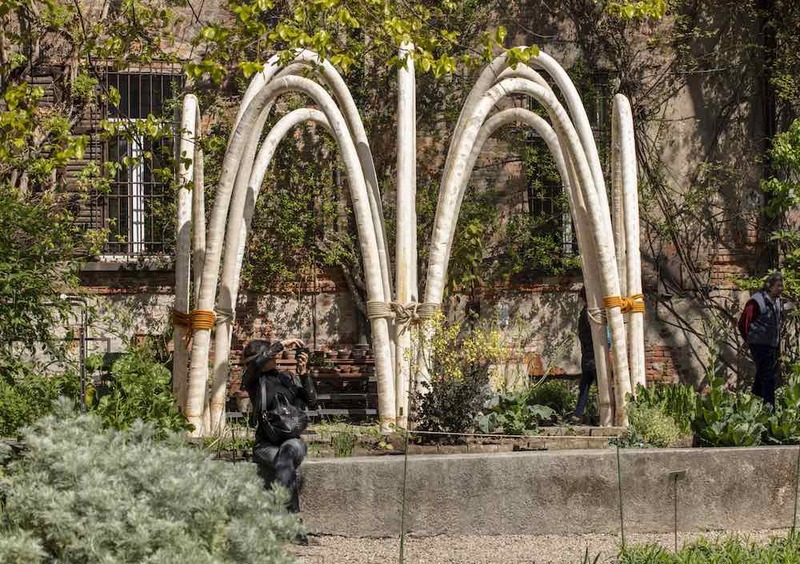 In a similarly organic manner, at the end of Milan Design Week, all the mycelium will be shredded and go back to the soil, just like a compost. “Nature is a much smarter architect than us,” says Carlo Ratti. 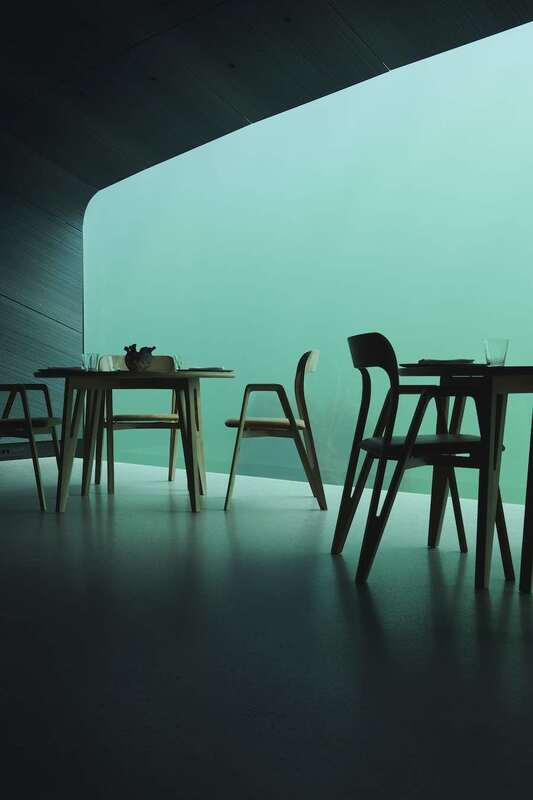 “As we continue our collective quest for a more responsive ‘living’ architecture, we will increasingly blur the boundaries between the worlds of the natural and the artificial. What if tomorrow we might be able to program matter to ‘grow a house’ like a plant?”. Many pavilions designed for temporary exhibitions and fairs – such as for Milan Design Week – end up generating large amounts of waste. The Circular Garden project will be reused in a circular fashion – mushrooms, ropes and wood chips will go back to the soil and small metal elements will be recycled. 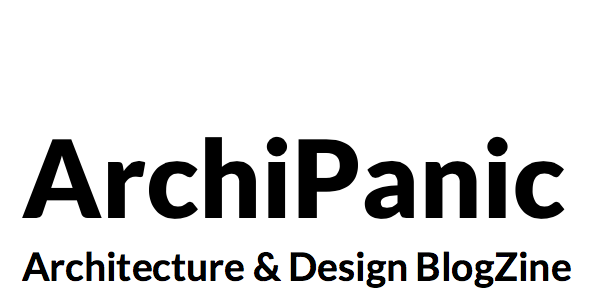 All photos by Marco Beck Peccoz – video by Edithink. 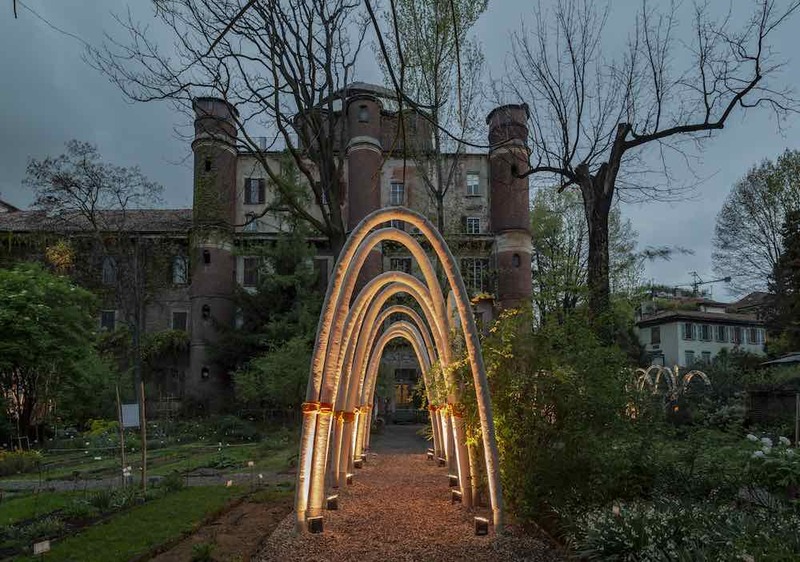 Courtesy of CRA-Carlo Ratti Associati.